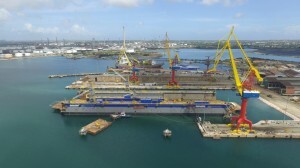 WILLEMSTAD - Damen Shipyards, the largest shipbuilder in the Netherlands, has done business in several countries with dubious intermediaries that can be linked to paying bribes. This is shown by research by NRC and journalist collective Lighthouse Reports into the business mores of Damen. These are dubious intermediaries and payments in Sierra Leone, Ghana, Togo, Libya, Brazil and Chile. In response to the findings, the Public Prosecution Service states that it suspects that it has actively, through intermediaries, paid bribes to foreign government officials to obtain foreign (government) orders ". Damen has traditionally been popular among government ministers and members of the Royal Family. Prime Minister Rutte praised Damen this summer as a "Dutch-born world player" and the royal couple visited this year a wharf of the company in Curaçao. NRC and Lighthouse Reports spoke with dozens of (former) employees of Damen, diplomats, civil servants and other parties involved at home and abroad. From these conversations and from internal documents, a picture emerges of a company with an overarching commercial culture, in which sales success is more important than ethical business. From these interviews, it also appears that the criminal investigation into Damen is stiff. This is due to the international nature of the case, but also due to opposition from the lawyers of the company. They take the view that relevant parts of the administration may not be used in the criminal investigation. The Public Prosecution Service: "The defense of the company states that part of the seized documents and data is covered by the privilege. A supervisory judge has to take a decision about this. That procedure is running." In a reaction, Damen states that the "accusations" are "partly factually incorrect and partly incomplete and misleading". Damen wanted to respond with more content and detail but says this is not possible because of the FIOD investigation.